Here's my Christmas gift to you. Or, at least some of you that are fans of the acerbic wit of Henry Morgan. Henry Morgan was a bit ahead of his time with his cynical comedy that would later flower with comedians like Bob and Ray and publications such as Mad magazine. Morgan got his start with a quarter hour stream of consciousness comedy show on Mutual where he was famous for skewering sponsors and poking fun at the conventions of radio. There's only a few episodes floating around of Morgan's fifteen minute show, even though Goldin lists several as being in existence - many from the Mutual run from 1941-42 and only two when the show was carried on ABC in 1945-46. Here's a previously lost episode of Morgan's work that I've not seen documented elsewhere, originally heard on June 10, 1946 on ABC and originating at WJZ, New York. In the show, Morgan pokes fun at Walter Winchell, takes us inside the mind of a landlord, referencing wartime rationing and shortages, and comments on the recent film "Cluny Brown" and Orson Welles's doomed Broadway musical version of "Around the World in 80 Days". The commercials include Gallo Wine, Esquire boot polish and Topps chewing gum. This episode of "Here's Morgan" appears to have survived because it was transcribed - the disc is part of a recent purchase I made of odd test discs and "throwaways" from various stations from a private collection. So, it can pay off to carefully go through stacks of odd discs like this from local stations. There's no scan on this transcription since there's no label - just a very light grease pencil notation on the label reading "Morgan" and "6-10-46" on the signle sided lacquer. Sometimes, the right talent comes together and the stars align, creating a perfect moment of artistry. That's what we have right here in this post - Old Time Radio magic. From May 8, 1947, originally broadcast on CBS, we hear the final installment in our mini-run of "Rosemary", sponsored by Ivory Snow. You can catch up on the previous two blog entries from the soap here. As we join our story in progress, Rosemary's amnesiac husband has remembered that he has another wife and a child that came into his life before he met Rosemary. In last week's episode, Bill had found his "old" wife and Rosemary returned home from her search for the "other woman" to find she had lost her job, but still had the support of her friends and family. In this episode, Bill Roberts arrives at a farm in Meadville with Audrey, the "other woman", and their child. There's an epidemic in the city and Bill is concerned that their daughter might be ill. As our episode begins, Bill and Audrey settle down in the house. Audrey doesn't seem too happy about being on the farm and seems a bit, shall we say, on edge. Just what is Audrey hiding? I think you'll agree that the actress playing Audrey gives a memorable tour-de-force performance as the most irresponsible mother of all time. The show includes some great musical commercials for Ivory Snow, including one about "Heartless Harry" and another about "Gorgeous Geraldine". As usual, we get our little reminder to save our used chicken fat. 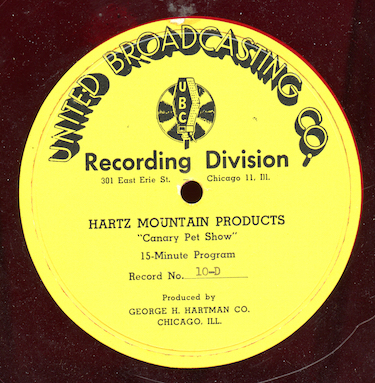 This previously lost/uncirculated episode of the series was transferred from an original Radio Recorders lacquer transcription; the label has a typo in the date, listing it as "1957", and is notated "Network". Here's a little mystery disc I'm posting to the blog in the hope that someone can give us an idea of what we're listening to. I recently won the disc in an auction and the seller didn't offer any further information about it or its origins. The disc is a 10" 78 rpm one-sided lacquer with a label from WHB Kansas City. Typed on the label is "Voices from the Air "Re Recorded" - 1925". The record, which has rather poor sound quality, includes various announcers giving station ids and sign offs. First, we hear Bill Hay, KFKX of Hastings, Nebraska; someone from WSB, owned by the Atlanta-Journal; WBAP, the Fort-Worth Star Telegram; and finally WHB, Kansas City. In the WHB id, they mention they're broadcasting from the "convention hall during the electrical and radio show" and that the regular programs of WHB and WDAF were originating from the convention that week, along with some information on tomorrow's program. Is this a genuine aircheck from a special broadcast in 1925, perhaps where there was a special multi-station hookup put in place? Is it a recording not recorded from the air, but from the convention, where announcers were giving the crowd and listeners on WHB an idea of what their station ids sounded like at the time? Or is it something else? If this is a genuine aircheck or a record from an early radio convention, it's certainly a unique bit of radio history. Elizabeth McLeod has a fascinating set of pages on "Documenting Early Radio", noting very few surviving airchecks or recordings of programs from that era. Most were experimental recordings of special events or tests done by Western Electric and Victor. I'm guessing this could be a dub, perhaps made in the 40s, from an original cylinder or disc recording made off the air or at the convention. Remote or off-air recording was cumbersome, but possible, in the 1920s; the material could have been captured on a home cylinder recording device or perhaps some equipment that was brought in specifically for the convention. Note the distance and primitive sound of the recording, which seems to have the ambiance of an event in a large hall, and how the information seems to be very specific to the event. Since the dub was found on an original WHB lacquer, it would make sense that the original recording was owned by the station or someone associated with the station, and would have had some significance to the station's history. And that does sound like Bill Hay. So, I think it's likely a genuine 20s era recording of the convention or broadcast and not a later recreation. I've done digging at the Google News archives, which includes items from the New York Times and ProQuest, but haven't found any article specifically mentioning a "radio and electrical show" from 1925 in Kansas. There were several exhibitions in different cities - Hartford in 1924 and Chicago and New York in different years in the 1920s. I did find some references to KFKX serving mid-West listeners with farm reports; it was moved to Chicago in 1927. Some simple networks and experiments with remote broadcasts were heard at the time, particularly the Democratic Convention and National Defense Day broadcasts in 1924 and the Cooledge inauguration in early 1925. "Bill Hay, the perennial Amos 'n' Andy announcer, once taught piano and ran a radio store. For two years he read and announced his own program, with potato sacks for sound-proofing and open windows to admit the air on the now extinct KFKX of Hastings, Nebraska." Potato sacks for sound-proofing? That certainly sounds like early radio. Or a dot-com start-up company. So what do you think about the recording? Please feel free to leave your comments with your own ideas and any info you might run into. Elizabeth McLeod quickly wrote in on the disc, as she's familiar with it. The original is a New Flexo disc, a flexible celluliod record from the 1920s that was used for advertising. "It's a dub of a souvenir recording made at the trade show -- all of those announcers were there in person and took their turns recreating their traditional station IDs. It was a gathering of mostly Southern and Western broadcasters of the sort that was very common in the mid-twenties. I don't have a specific date, but I imagine you'd find it mentioned in Radio Digest that summer. "The WSB announcer is Lamdin Kay, who was one of the most famous radio personalities in the country at the time, and the first to use chimes as a station id signal. The Texas station is WBAP in Fort Worth. "Bill Hay indeed started his radio career at KFKX, which was in the same building as the piano company where he'd worked as a salesman." Sometimes you run into a disc that doesn't look very promising, but can hold a bit of a surprise. "From the Bookshelf of the World" doesn't sound like it would be an interesting Armed Forces Radio Service series. But, this one features a lost performance by actor Boris Karloff. Program 74 in the series is "On Borrowed Time", based on a play by Paul Osborn, and stars Karloff as Mr. Brink and character actor Parker Fennelly as Gramps. The story, if you're not familiar with it, concerns a little boy, an apple tree, and Death. The disc is undated in the matrix, but I think it may be from the Mutual series, "Great Scenes from Great Plays". A Karloff fan site lists his appearance in "On Borrowed Time" in that series on October 29, 1948. However, the site credits Karloff with the role of Gramps, so I think it may be in error. "On Borrowed Time" was made into a film in 1939 with Lionel Barrymore and Cedric Hardwicke. Osborn worked as a screenwriter in Hollywood with movies like "The Yearling", "South Pacific", and "East of Eden" in his list of credits. 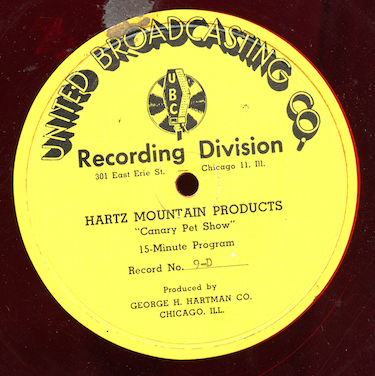 The show was transferred from an original undated AFRS vinyl transcription. Update, 2.20.10 - A listener has posted the original newspaper ad for the show. You can find it at this forum (scroll down the page to see the ad). Also corrected the spelling of Parker Fennelly's name in this post. Let's return to "Your Movietown Radio Theatre", a seldom heard series syndicated by Frederick W. Ziv circa 1947-1948. Program 24 is, I think, a previously uncirculated episode, "The Sound of Her Voice", a charming, dark little comedy about a man who finds a genie in a bottle. Our star is Robert Hutton. Since the show was syndicated, you don't hear the opening, just a music bed, since a local announcer would have kicked off the program with a plug for a local sponsor. The show was transferred from an original vinyl Ziv transcription, matrix numbers UR 174915 AU1 and UR 174916 AU1. The disc set is very scratched, so I had to run it through some click reduction software. Sorry, but no label on this entry - the discs had water damage and the label is obscured. A few months back, we heard the first show in the series "Mercer Mcleod, The Man with the Story", syndicated by NBC in the 1940s. In the show, talented actor Mercer Mcleod plays all the roles, except the females, which are played by the mysteriously billed "Rita". All the shows have a supernatural theme, so that makes Halloween a good time to give another program in the series a spin. Program 2 in the series is "Music Box from Hades", concerning a man who finds a music box that can kill. The show was transferred from vinyl NBC Orthacoustic Syndicated Program Series transcription, matrix ND5-MM-11445-5. If you ever run into any transcriptions for this series, let me know - I really enjoy it and would like to add more to my collection beyond the single disc I have.